Each 2015 Mega-Tin design is based on a monster from the newest generation of the Yu-Gi-Oh! TV series, Yu-Gi-Oh! ARC-V. ARC-V Duels showcase the various kinds of monsters that the Yu-Gi-Oh! TCG has seen over the years in all-about battles against one another. 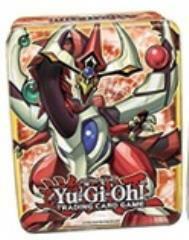 This year’s Mega-Tins feature Odd-Eyes Pendulum Dragon and Dark Rebellion Xyz Dragon. Each Mega-Tin will include three 16-card Mega-Packs with cards taken from past releases: 12 Common cards, 1 Rare card, 1 Super Rare card, 1 Ultra Rare card, and 1 Secret Rare card. Three variant cards are also included in their respective tins: 2 Super Rare cards and 1 highly collectible Platinum Secret Rare card of the Mega-Tin cover monster! There will only be one Wave for the Mega-Tins, so Duelists will be sure to collect both designs before they’re sold out! Each 2015 Mega-Tin includes three 16-card Mega-Packs and three variant cards.